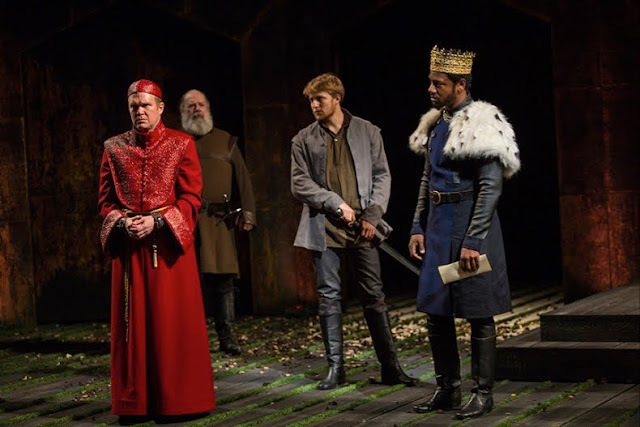 Carol's Theatre Reviews ~ It's Fun To Go Out: Old Globe’s Shakespeare’s “King Richard II”: Politics in the rough. Old Globe’s Shakespeare’s “King Richard II”: Politics in the rough. Of all the sports currently being played out on the world stage today, politics is by far the dirtiest, backstabbing, most talked about, examined and throat cutting game in the market place. Today the players wear uniforms of a different cut than in Shakespeare’s day (or not). Today most are in blue suits, red or blue (or variations of the same) ties and most carry a big stick and a self- satisfied smirk. Most have been in training for years some not, but that matters not. Yes, ‘ art imitates life’ and in a big way this sporting political season. Think Shakespeare in the Park and Oskar Eustis’ and “Julius Caesar”. That struck a nerve and rightfully so. Sometimes bad things happen to bad people who tamper with less fortunate people’s lives. Sometimes it just takes a while for the oppressed to catch up. Since we here in San Diego are pretty far from away Central, we prefer our Shakespeare in our very own Balboa. 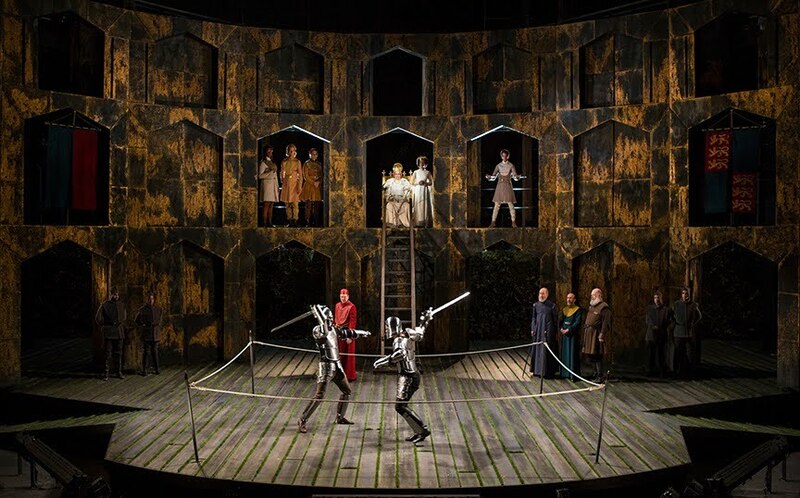 This summer, it’s one of the Richard’s, II in fact and only one of four plays the Bard has written entirely in verse. That said one would have to pay close attention to realize it. I was surprised, though and moved when out of the blue several including Bishop of Carlisle (James Joseph O’Neil), Bolingbroke and Mowbray began chanting their lines. I felt as though I was experiencing a religious moment. James Joseph O'Neil, John Ahlin, Samuel Max Avishay, HArry Percy and Troy Kittles. 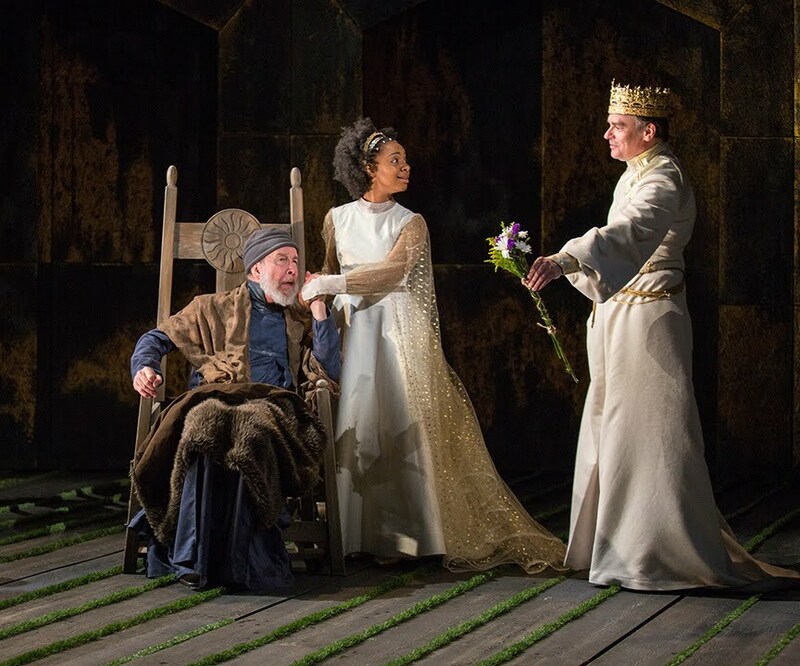 The Kings; John, Richard II, Henry IV part I, Henry IV part 2,HenryV, Henry VIpatr1, Henry VI part 2, Henry VI part 3, Richard III, and Henry VIII make up Shakespeare’s ‘history tetralogy’. Most are often produced, some of a lesser nature. 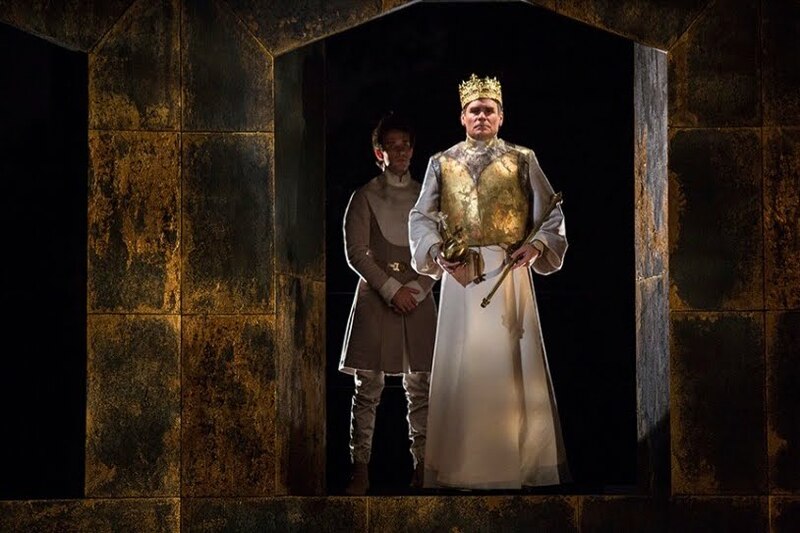 The current offering on The Lowell Davies Festival Stage at The Old Globe through July 15th, in its season opening is of the lesser; “King Richard II”, written well before his more popular “King Richard III, is stuff we now chew up and spit out without a thought. When Richard II banishes or exiles his two adversaries (one his cousin), steals from his flock, distances himself from his people, raises money for an army and raises taxes on the backs of the poor, Shakespeare memorializes him more as a man in conflict with himself and as a poet rather than a flawed, arrogant and oppressive ruler. What excuse do we have? The Old Globe’s ‘Richard’ under Erica Schmidt’s direction is rich in talent, politically current enough to start a million conversations and designed to stretch the imagination (John Lee Beatty’s set is enhanced by Stephen Strawbridge’s lighting design) with the huge backdrop of ancient looking doors set high above the stage and used effectively when the cast (Greek chorus?) has something to say or so or do, as when they throw dirt and garbage at the toppled king) without being directly on the stage. It’s very effective. The play opens with a dead body wrapped in gauze and waiting to be removed. It was the Duke Of Gloucester one of the king’s four uncles that some believed the King had a hand in his killing. We find stage and screen star Robert Sean Leonard sitting on his golden throne dressed in a long white gown trimmed in gold (Andrea Lauer), high above the masses looking over those assembled down below. He is now officially of the age to be monarch and not a popular one at that. His task on this day is to settle a dispute between his cousin Henry Bolingbroke (Tory Kittles), son of John of Gaunt, Duke of Lancaster (Charles Janasz) and Thomas Mowbray (Ian Lassiter) who is accused of treason by Bolingbroke. In order to settle the dispute between the two men a sword dueling contest is the day’s entertainment. There is a glove throwing battle that goes on for a bit adding some humor to their declaration of battle. Both are armed to the gills and in an arena of sorts cordoned off to keep the two from?? Falling of the stage? Well not to worry. As soon as the swords make contact, Richard throws his golden gauntlet down calling a halt to the duel. Instead the King decides to exile both: Mowbray forever and Bolingbroke for first ten years and on second thought, six years. That turns out to be a miscalculation on his part. No one is happy with the decision. Unbeknownst to the king, plans were already in the making to dethrone him. Bolingbrook is convinced that Richard stole lands from his father that eventually would belong to him. Richard, because of his flawed and weak character, his arrogance by taking lands that did not belong to him, and his catering to the rich, failed to acknowledge that Bolingbroke had the support and admiration of the commoners. They favored him over the King. While Richard is away fighting a war in Ireland, Bolingbroke is gathering his own army. Bolingbroke’s eventual invasion of England with his own army of loyalist allows him reclaim the throne and eventually as history will attest, be crowned King Henry IV. And so begins the saga of tormented and flawed King played with an astute interpretation, more of the poet than the warrior and ruler by Robert Sean Leonard. Self –assured that he is divinely chosen, yet conceited, ambivalent and disconnected from his people and territories, he loses his hold on reality and everything else connected to his kingdom. When he is finally forced to give up his crown, no bloodshed here, and is sent off to prison do we see the man under his blond wig (nice touch) and golden crown. It is here in prison that he finally comes face to face with his own mortality. In some ways I found him to be a pathetic character as he wept, talked to himself and looked for some support from the prison guards. That did not last too long, though. Leonard is a fine choice for the King. 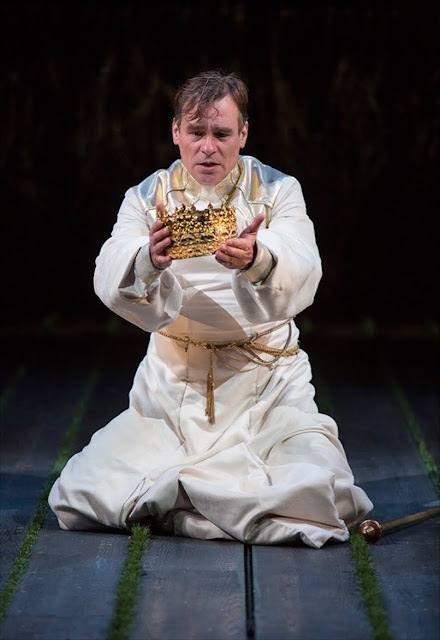 Charles Janasz, a familiar actor seen in almost all the Shakespeare of years past, is a welcome sight as John of Gaunt and later The Gardner. As Richard’s uncle he lives long enough to curse Richard after he sends his son into exile. He knows that Richard is responsible for his brother’s death. “Let heaven revenge; for I may never lift An angry arm against His minister.” Janesz as always makes every production he’s in noteworthy. 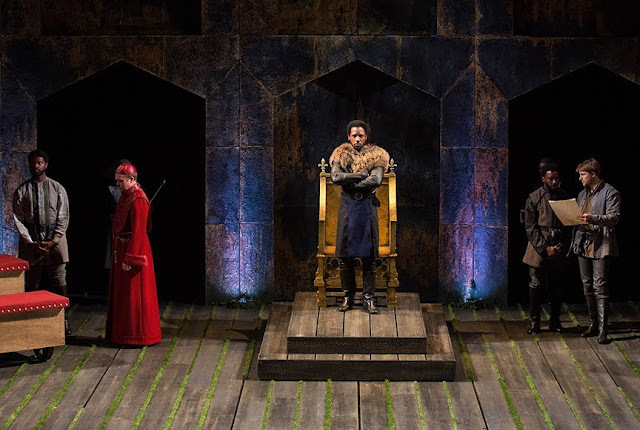 Troy Kittles is as regal as any anointed king as Henry Bolingbroke. He’s intriguing to watch as he moves throughout as a thorn in Edward’s side and exits the victor. Ian Lassiter serves Mowbray well in his exile scene and Elizabeth Mackay, as The Duchess of York is stunning as she pleads for her son’s life. Richard’s wife Queen Isabel, (Nora Carroll), is none too pleased with her King. Suffice it to say, he has little interest in her. Several MFA students also turned in fine performances, while having little to say as well but looking busy none-the –less. Overall Schmidt’s efficient direction keeps the play moving at a nice brisk pace, enough to keep the sandman out of this reviewer’s eyes. As far as the politics are concerned, keep your eyes on the bouncing ball. It ain’t over till it’s over. Scripps Ranch Theatre “Loves and Hours” charms.